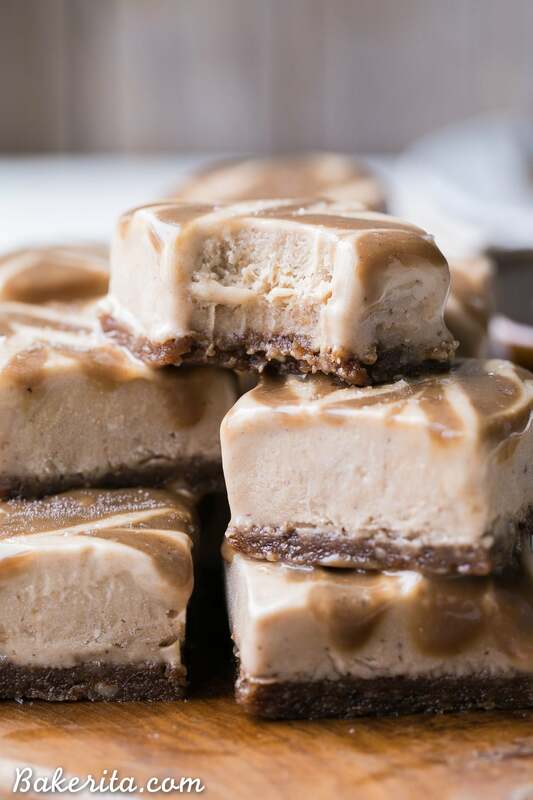 These Frozen Caramel Banana Bars are easy to make in a blender or food processor, and they’re super creamy and refreshing. 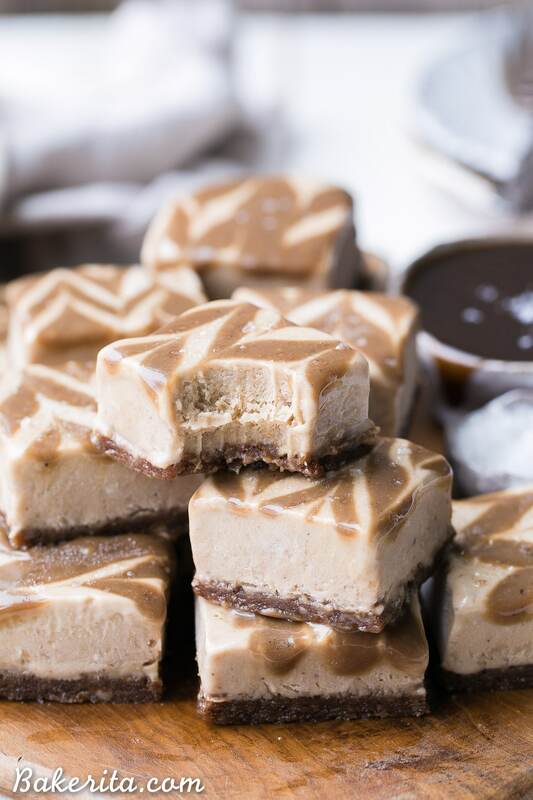 These gluten-free and paleo bars have a chewy pecan-date crust, topped with banana nice cream and a caramel swirl. This post is sponsored by Vital Proteins. I’ve been making these frozen caramel banana bars since last summer, when I first dreamt up this recipe. I’ve been testing it since, with different types of caramel and different versions of crust, trying to get it just right for you guys. It had to happen this summer, because I can’t give you guys frozen treats when it’s cold out…though that would definitely make them easier to photograph. But these guys were meant for summer – they’re cool, creamy, and refreshing. Definitely the thing you want on a warm spring or summer day! The crust on these guys is made very simply, with two of my favorite ingredients: dates and pecans. The sticky dates and crunchy pecans form a sticky, sweet dough – with a touch of cinnamon and salt, it’s the perfect chewy base. My boyfriend was amazed at the simplicity of the crust ingredients, and wanted more…these Pecan Pie Protein Bars are essentially an XL version of that crust, and just as good. On top of the crust, we’ve got the irresistibly smooth and creamy banana “nice cream” filling. The filling is simple: just frozen bananas, cashew butter (or whatever your fave nut butter is), vanilla extract, coconut milk, and the Vital Proteins goodness! I added Vital Proteins two ways: first, I upped the protein of these bars with a few scoops of grass-fed collagen powder. I also added a tablespoon of grass-fed gelatin that had been dissolved in water. 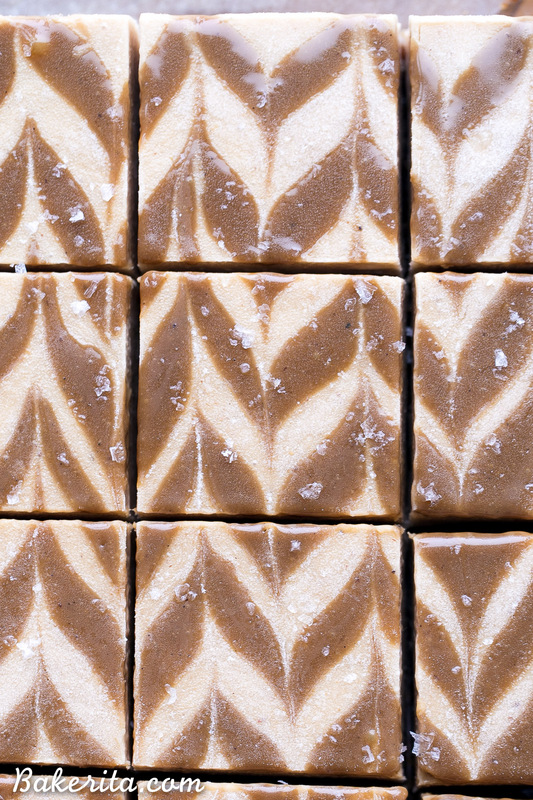 The gelatin firms up, which helped the bars to keep their shape and hold off melting a bit longer than usual, as well as adding even more healthy proteins. It’s important to make sure you add the melted gelatin when your high-powered blender or food processor is running, so it doesn’t turn into clumps in your banana nice cream – you want it to get fully smooth and incorporated into the mixture. Once it’s perfectly smooth, you can spread it out over your scrumptious crust and swirl the luscious caramel on top! 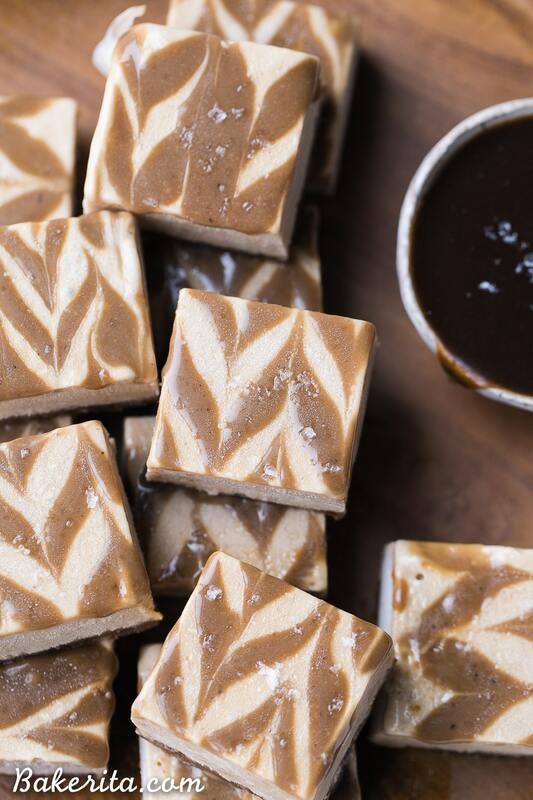 I used my favorite paleo and vegan caramel sauce to swirl on top – it’s absolutely delicious, and has the perfect texture for drizzling and swirling. 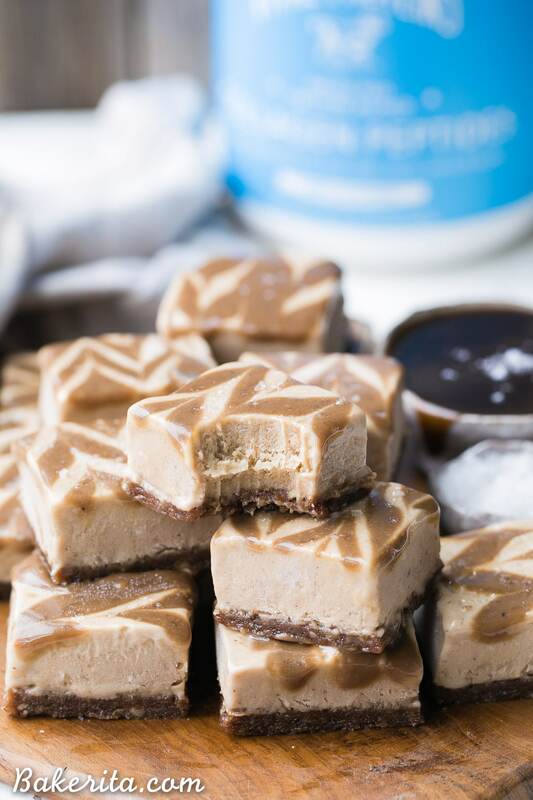 I also tried this recipe using a “quick caramel” made of almond butter, coconut oil, and maple syrup, but it firmed up more than I enjoyed…I found the “real” caramel to be far superior, because of the wonderfully chewy texture it took on after being frozen. It is a little more work, but definitely worth it. A batch of this paleo caramel sauce will make more than you need for this recipe, so it can be saved to drizzle on just about everything too! Of course, any other caramel sauce you have on hand would do the trick too. Whip up a batch of these and keep them in the freezer for those hot moments of summer when you need a cool sweet treat! 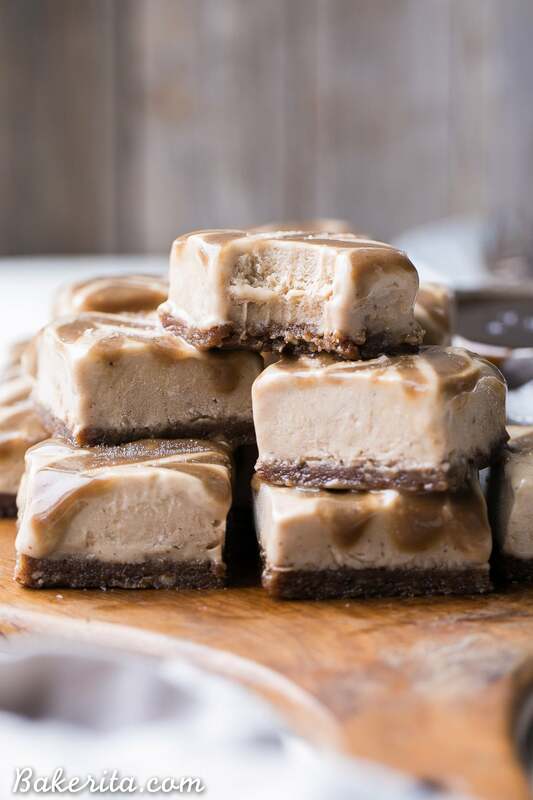 These Frozen Caramel Banana Bars will definitely satiate the craving. Enjoy! Line an 8x8” square baking pan with parchment paper. In a food processor or high powered blender, pulse the finely chopped dates, pecans, and kosher salt until the pecans are broken down into small bits and it sticks together like a dough. Be careful not to over blend. Press the pecan date mixture evenly into the bottom of the lined pan. Set aside while preparing the filling. Combine the gelatin and cold water in a small bowl and stir to combine, let stand to bloom. In a food processor or high powered blender, combine the cashew butter, bananas, vanilla extract, and blend until smooth. Heat the gelatin mixture for 20 seconds in the microwave until its liquid. Turn the blender on low and with the blender running, drizzle in the gelatin. Let blend to combine fully. Spread the banana ice cream evenly over the prepared crust and drizzle with the caramel swirl. Use a knife to swirl it into the banana ice cream. Place in the freezer to harden for at least two hours before cutting into 16 squares with a sharp knife. To help cut clean slices, run the knife under hot water in between each slice. Store in the freezer. This post is sponsored by Vital Proteins. Thank you for supporting the brands that support Bakerita! Aren’t dates such a magic food?! Thanks so much Casey. Holy cow Rachel, these ice cream bars look insane! That caramel swirl is deliciously mesmerizing! This recipe is reason #485 why you’re one of my favorite bloggers! Thanks so much Bethany – you’re too sweet! Can the collagen powder be substituted with anything else? Hi Diana, you can just leave it out if you don’t want it in there! It wouldn’t make a big difference in the taste considering the recipe calls for 4 scoops? Hi Diana, collagen is pretty much flavorless so it wouldn’t make a difference! It just affects the protein levels, since collagen adds protein. Could you use almonds instead of pecans in the crust? Hi Heather, definitely! Any nut you like would work. Enjoy!